While the rain gods held off all week, the medal races for the 470 World Championship took place today, run by the Royal Danish Yacht Club off Rungsted harbour, in conditions varying so wildly that Beijing Gold medallist Malcolm Page described them as “like four seasons rolled into one”. And so, following today’s double points scoring Medal races for the top ten placers in each event, men and women, Croatia’s Šime Fantela and Igor Marenić are the new Men’s 470 World Champions, while the ever consistent Dutch women, Lisa Westerhof and Lobke Berkhout, have won this year’s World title in the Women’s event. Going into the medal race, the Croatian men were looking comfortable in the Gold spot with a 16 point lead over the second placed Japanese, Ryunosuke HaradaYugo Yoshida, winners of this year’s European championship. The main fight was on for the remaining podium spots with the Japanese separated by just two points from the Netherland’s Sven and Kalle Coster, the class act earlier this week, and the fledgling British duo of Luke Patience and Stuart Bithell. 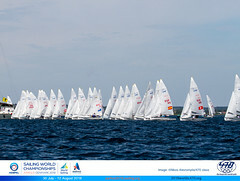 With the wind initially out of the west, the unpredictable offshore breeze the sailors dislike, racing got underway for the Men shortly before 1500 local time. The race, held on the shorter medal race course, closer to land, turned into a nailbiter with the lead changing on the first three legs. On the first upwind, the Costers chose the extreme right while the British were furthest out to the left and narrowly led around the top mark. On the downwind Spain’s Onan Barreiros and Aaron Sarmiento had taken the lead, while a big left hand shift on the second beat saw Australians Matt Belcher and Malcolm Page surge up to first, which they never relinquished. The Croatians finishing immediately behind them was enough to secure their Gold, while a solid fourth place for Patience and Bithell allowed them to take silver, tied on points with the Japanese HaradaYoshida, who moved down to the final spot on the podium. But it wasn’t only the varied conditions putting knots in his stomach. “The race was not so sure for us, because I thought we were OCS on the start. We had a good start and the opening of the race was really good, but because I thought we were OCS, I started to watch where were our opponents – the Japanese, Costers and the British. Then when the British rounded first and we rounded seventh with the Japanese and the Costers behind us, it wasn’t so good because I was thinking if ‘we are OCS and he is first – we lose!’ Then when we got to the finish I saw we were not OCS and I was really, really happy. I feel really good, really good now,” said Fantela, once he’d arrived back at the Rungsted harbour slipway to be showered with congratulations from both his team and rivals. Most surprising was the result of the 23 year olds Patience and Bithell, one of the youngest teams in the Skandia Team GBR Men’s 470 squad. 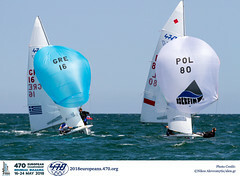 They pulled up two places in the medal race to take silver, despite being such a new pairing that they had only sailed for five days prior to embarking on this World Championship. But the class act of this 470 World Championship has been another new pairing: that of the Netherland’s Lisa Westerhof and Lobke Berkhout. 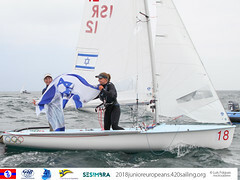 They went into today’s medal race with a commanding lead, only to win it, thereby coming out with the lowest score across both fleets – just 36 points, 24 ahead of the second placed young Spanish crew, Tara Pacheco and Berta Betanzos, while French long term campaigners Ingrid Petitjean and Nadège Douroux retained bronze. The majority of the sailors in this World Championship are soon to be heading for Weymouth in the UK for the Sail For Gold Regatta over 14-19 September. Next year’s World Championship takes place over 9-18 July 2010 in The Hague in the Netherlands. At the conclusion of the regatta Morten Lorenzen, CEO of the Royal Danish Yacht Club commented: “We are really happy – and tired. It has been a really big event for us, but with such a dedicated group of volunteers who have worked from early morning till late night, we have managed to achieve what we set out for: to hold a really great event for the sailors. And the order we send to the weather gods before the event, also came through!